It’s all about scheme fit and need when it comes to safety, as this class offers the usual variety of free safeties, box safeties and movable chess pieces. Florida State’s Derwin James is the star of the class, but beyond him is a near-interchangeable list of players depending on scheme fit. 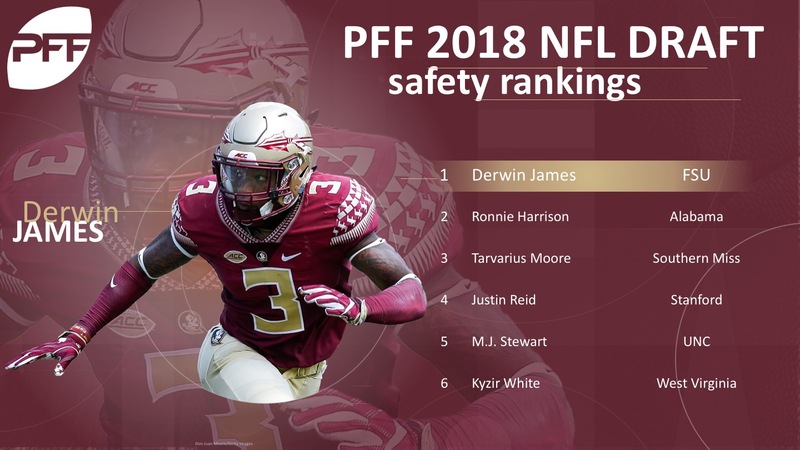 The PFF draft class evaluations are evolving throughout the next two months, but here’s a look at the top safeties in the class to this point. Version 2 of the 2018 NFL Draft Guide is here! For PFF Edge & Elite subscribers, a comprehensive guide featuring player profiles of signature stats, grades and exclusive PFF content including position by position rankings. Find out more information here and join PFF now! James has all of the tools to become a game-changing playmaker at the next level. His size and athleticism allow him to make plays in coverage, against the run and as a pass-rusher. All of James’ skills led to him becoming the nation’s top-graded safety in both 2015 and in 2017. He can be a coverage weapon in a two-high safety look or in man coverage against tight ends and slot receivers, while his size allows him to be a force in the run game and to get after the quarterback. Harrison is at his best playing closer to the line of scrimmage, where he can be a factor against bigger receivers and make plays in the run game (85.1 run-defense grade in 2017). He’ll struggle if he needs to match up against shiftier slot receivers or if he needs to play too much single-high free safety, but he has an excellent feel for the short pass game as a zone defender and fits a traditional strong safety or dime linebacker role very well. Moore brings some versatility to the table, as he flies to the ball on underneath routes and he has the movement skills to hang with receivers when matched up 1-on-1. His eight pass breakups had him tied for fourth in the nation and his length is a weapon when playing underneath zones. Moore plays his run responsibilities well, but he’s not physical at the point of attack and his best value is as a movable coverage piece at the next level. Reid played a challenging role in Stanford’s defense as he had to cover shifty slot receivers, hurting his overall grade, though he has the skills to excel in more of a traditional safety role at the next level. He can stay in phase when covering down the field and he has the ball skills to create turnovers, though he must cut down on the big plays and ugly snaps in coverage that hurt his overall production. More of a matchup weapon on defense than a true, pure cornerback, Stewart’s NFL future may lie as a kind of hybrid player on defense. The good news is those players are in demand at the moment and his ability to cover the slot as well as match up with receiving weapons like backs and tight ends in the passing game will push his value up. He also played and graded well at the Senior Bowl, which is always a plus as teams see players against elite competition. With size, movement skills and two years of solid production under his belt, White has a chance to be a hot name during the draft process. He played West Virginia’s slot role, which consisted of mostly spot-drop zone play where White showed good range and ball skills. He attacks the run and screen game downhill, and his experience in WVU’s system should serve him well as a curl/flat defender in a box-safety role at the next level. A four-year starter at Virginia, Blanding had three excellent years of grading and one poor season in 2015. He fits best in a split-safety role, where he has sufficient range and can work downhill against the run, particularly in quarters looks. Blanding finds the ball well in the run game and he’s a sure tackler, as he missed only 43 of his incredible 502 tackles attempts during his career. Elliott improved every year at Texas, finishing 2017 with a strong 85.5 overall grade. He has good range at deep safety, often finding himself in the right place at the right time, and he secured six interceptions last season, though that number could have been much higher, as he dropped a number of turnover opportunities. He’s not a physical force against the run, but Elliott can fly to the ball and his range makes him one of the better free safety prospects in the draft. Perhaps the best pure free safety in the draft, Webb has outstanding movement skills that allow him to make plays on the ball from a single-high alignment. His quickness is also on display when covering slot receivers, which allows Webb to offer up a versatile skill set for creative defensive teams willing to use him on the back end and in the slot. Webb’s not great in the run game, but his lateral quickness makes him one of the more unique talents in the draft. Players used to be tarred with the ‘tweener’ tag as a negative, consigning them to a career-long struggle to conform to one position and fit into the NFL, but now those players are matchup weapons on defense, and Weatherspoon could be a perfect matchup weapon. He is a safety with experience manning the slot and shows good feel for zone coverage in either role. He enters the league at the perfect time for him to make an impact. Bates has excellent movement skills and he’s one of the few safeties capable of matching up 1-on-1 with receivers. He can attack downhill in the run game, making him a good fit for a quarters-heavy scheme, though he must cut back on the 16 missed tackles that littered his tape last season. A traditional box safety at the next level, Allen works downhill well in the run game and has the skills to play as an underneath zone defender. He’s graded as an above-average run defender each of the last two years, but his coverage grade has been average, showing that he’ll have some limitations at the next level. However, Allen can hold his own in split-safety looks, and he has the size to match up with tight ends one-on-one, giving him just enough coverage value to complement his ability in the run game. Watts can fill multiple roles on a defense as he has the skills to cover slot receivers and he shows good range on the back end. He must cut back on the missed tackles after missing 55 during his career. Igwebuike has plenty of experience after playing 3,191 snaps during his career at Northwestern. He posted three straight years of 80.0-plus grades, doing his best work on the run game and showing capable in coverage in two-high looks. Whitehead had a solid career at Pittsburgh, though his career grades decreased every year after an impressive debut as a true freshman. Tackling has been an issue where he missed 36 of his 265 career attempts. Jamerson is excellent in true free safety situations and he tied for 14th in the nation with six pass breakups last season. Queiro’s size makes him a weapon in the run game and he’s capable of matching up with tight ends in man coverage, though slot receivers had their way with him in college in 1-on-1 situations. He finished with a strong 87.4 overall grade last season. Reaves had a breakout 2017 season, grading at 87.8 overall, showing well in the run game and in coverage. He broke up 18 passes on 174 career targets. An athletic safety, Edmunds moves extremely well, though he had far too many plays in which he ws a step out of position at the catch point. His best overall grade came in 2016 when he posted a 76.8. Roberts had an up and down career at Auburn, capping it with a strong 85.7 overall season in 2017. He finished with 10 career pass breakups on only 76 targets. Chandler has over 3,000 snaps and strong production under his belt at Temple. He’s a strong tackler, missing only 20 of his 289 career attempts and he allowed a passer rating of only 74.0 into his coverage in his four-year career. One of the more unique stories in this draft, Reavis comes out of Marshall by way of Last Chance U and East Mississippi Community College. Can play free safety and cover the slot, but will miss too many tackles. Apke crushed the NFL Combine and his strong movement skills do show up on tape as he closes quickly on underneath routes. He’s still a step slow far too often in coverage and he missed 17 tackles on only 122 career attempts. Solid across the board for four years at Oklahoma, Parker doesn’t do anything exceptionally well and he must cut down on the big plays as his penchant for going for the highlight-reel hit has done him in far too often.